Last week I had a very interesting experience in the park. I have never seen or at least noticed this event before. As I walked the outer perimeter of the park I noticed a large flock of crows on the ground. I’ve seen crows gather in pairs or even 3 or 4 in a family group, but this was different to me. I know that they commonly stay and live in a flock in their home territory, but I personally have seldom seen them travel in groups larger than their family. These birds were all gathering upon the ground in the very center of the park where I walk a surrounding trail. There must have been 50 or more. By the way, a flock of crows is called a “murder.” This reference serves as an interesting metaphor, as we all know that so much of the body of Christ has already suffered what can resemble a murderous plight. Mostly ravaged by a homicide to our identities. As I listened to the clamoring of this “murder,” The crows refused to be ignored and all seemed to be cawing their complaints at me! I was the object of their attention and had no idea why. This seemed a bit odd, and made me feel very conspicuous. FYI: I’m not a fan of crows per se, so was also not impressed by this show of notoriety. I had in the past, always considered the crow an animal which was unclean or often used for occult activity. They have not been my favorite bird by any means. However, a year or so ago, Papa began to speak to us through a dream about the crows and their cousin the raven. He was definitely highlighting something, but what? As far as the crows or ravens go in Biblical context, they were those who had been chosen to be used for God’s purposes in feeding or sustaining the prophet, Elijah while in hiding from certain death at the hand of Jezebel. It was Jezebel’s plan to kill every one of God’s prophets in the land, so that she could stifle the very word of God’s heart and intent. God’s prophetic word is creative and brings His kingdom purposes into the earth, this is the reason the enemy works so hard to shut the prophetic down. There is always someone willing to kill the prophets of God, or kill the message they carry. 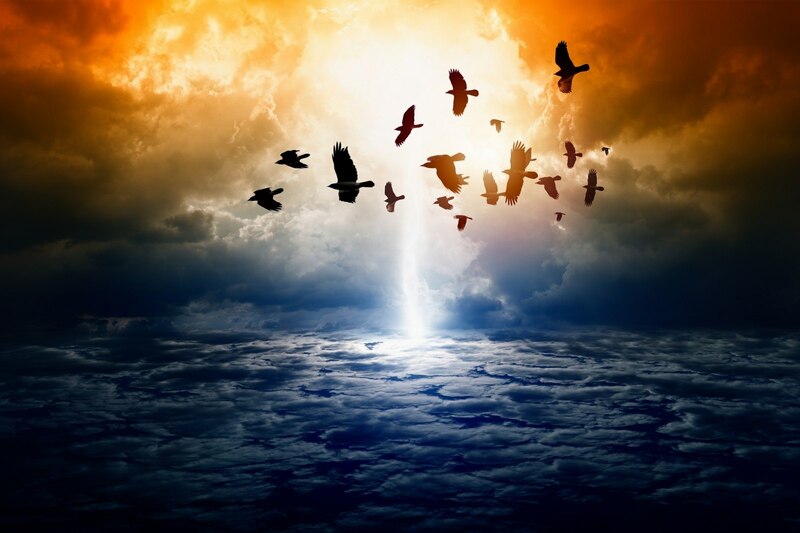 Sigh… As I pondered the story that I remembered so well about Elijah and the provision God supplied for him, I began to correlate the crows to some of the modern day prophets. Maybe the crows represent those whose gifts were not considered copacetic in a traditional church setting, but were by all means given to serve and to support the intent of God’s heart. I love the way God speaks through events that He carefully orchestrates in the lives and journeys of humanity. He is always speaking and always revealing what we need to know. Some of us just need to learn not to judge the way He chooses to do so. I’m still working on that. 🙂 I could see how Papa was highlighting a group of perceived outcasts to remind me that He does not send the qualified, but rather qualifies those He sends. He often employs the misunderstood and disenfranchised, because they are often the ones who lean the hardest into Him. Have you noticed of late, that there has been a lot of discussion and sometimes dispute around the representation of the crow in the prophetic community? There was a somewhat popular photograph and story in the national news not long ago about an eagle allowing a crow to ride upon his back, with no retaliation. There was much speculation from that publication (most of it negative), but as I have sought Father about what the crow represents, things are becoming more clear. Most of us consider the crow a pesky bird who ignores our “shooing,” as we blatantly encourage him to take up residence in someone else’s yard. The tenacious and invariable, continuously squawking crow. It seems he always has something to say, but never in a gentle voice. 🙂 Even the tone of his voice is like fingernails upon a chalk board. Interesting, that as they were all yelling at me that morning, I felt very strongly that they were trying adamantly to tell me something. I was uncomfortable with the thought of listening to their seemingly urgent communication. Now, just to be clear, I don’t usually hear or understand the conversations of animals. This is not one of my gifts and is definitely out of my wheelhouse. However, if Papa clearly highlights something to me, I’m all ears. Whatever or whomever he chooses to speak it through. Upon listening more closely to the tone of their squawks, I eventually began to get the distinct sense that they were all groaning and complaining about the perception humans have of them. And yes, I was guilty! I know that sounds very strange, but God speaks in the most interesting ways sometimes, and I am still learning to listen. This, I must say was one of the most unique experiences I have had, and I’ve had some very interesting experiences. As I continued to observe, I began to noticed one or two very small swallows diving at the murder of crows. There seemed to be more and more as I watched. They were diving low over the heads of the crows, and returning to repeat this courageous display. They immediately had my attention; as we were recently called to herald prophetic messengers into Washington State and California through a prophetic trip to San Juan Capistrano, CA, welcoming the swallows to the famous mission. Things were finally beginning to make more sense. I watched intently as more of the small swallows joined in to what began to resemble a remarkably trained group of highly synchronized aircraft directed at and over the crows. I felt like I was watching the Blue Angels in one of their skillful routines for an airshow. It was exhilarating! I was full of excitement as I inquired as to what it was I was witnessing. I got the immediate sense that the swallows represented a pure hearted, current day prophetic sound, instructed, prepared and trained to identify an edgy community of prophets who have been hidden like Elijah for survival. These would be individuals who have the heart to speak into the future generations of The Church, the ones who choose intimacy with The Father over planning programs. They would be prophets to the prophets! This explains why Papa gave us the mandate to prophetically visit San Juan Capistrano releasing the frequency of His heart, welcoming the swallows (prophetic heralds) into California and Washington State. He is releasing a clarion call to raise up and fulfill His purposes in the earth. All of creation will know and worship Him, because of His desire to be in relationship with us. Mankind is drawn by His Spirit and wooed by His goodness. I believe, as others do, that the face and heart of the church of Jesus Christ is in need of change. In desperate need of reconstruction of any disrepair; and the new structure will look much different than what we’ve known. The pure of heart are those who’ve obtained by God’s Spirit, the ability to lay aside offense against religious structures, stepping firmly into all foundational truth that they may have learned within those walls. We need and thrive on truth! The truth is that The Church is the beloved Bride of Christ. He wants to be restored to His beautiful bride! Each part and individual in the body must reflect upon who God is and experience change in His presence. Change comes individually while in His presence and relationship with Him; and by hearing His plans for our lives, which is His prophetic voice and frequency that calls us to return to our original design. He is calling us out and it is not in rebuke, but to convict us to mature for the work ahead! The swallows were literally prophesying the potential future of the crows!!! I saw in the spirit the words that they chirped in utter confidence falling upon the black and disheveled outcasts! They were releasing the sound of Father’s heart into the DNA of the crows! Wow!! Redemption!! Each crow, though an unlikely prophetic hero, will be in need of God’s intent spoken into them, so that they can mobilize a fresh move of The Spirit. This move will provoke unique ground-breaking prophets to go deep into the trenches to find the wounded and broken like themselves. They will not fear pain or the loss of life. They will have already experienced both, and nothing will deter them from fulfilling their call. Not the trappings of this world, not relational issues and not the fear of death itself! The words of Creator’s heart will redeem the call of these messengers, transforming them by His word alone, into His glorious Bride! The swallows were encouraging, comforting and edifying those who are called. I sensed so strongly that those with pure hearts will prophesy the true call and destiny over the lives of those who have been marked for this strategic time in history. Those who have been rejected and looked down upon by a proud and religious society. These will have a voice, releasing healing and love to a spiritually impoverished world. The world wants to hear a real message from individuals who have lived an authentic experience. I believe that the words and intent of Papa’s heart to those outcasts will transform them into unique and effective carriers of a critical message that He desires to deliver to a hopeless civilization. That these will become precise mouthpieces, sharing the heart of God, which is to be known by all of His creation. These will have the opportunity to reach others who have hidden underground, no longer exposing themselves to opinion and judgement of common society. Only the pure of heart will be trusted by those who have hidden themselves. The message that the pure carry to an outcast company will unlock what is needed to reach the ones who’ve been concealed. God’s heart and intent will then be released to an invisible wounded world.